Making good progress on this. What I’ve done here is connect my MRC Prodigy Express DCC system to my Control Widget Platform. 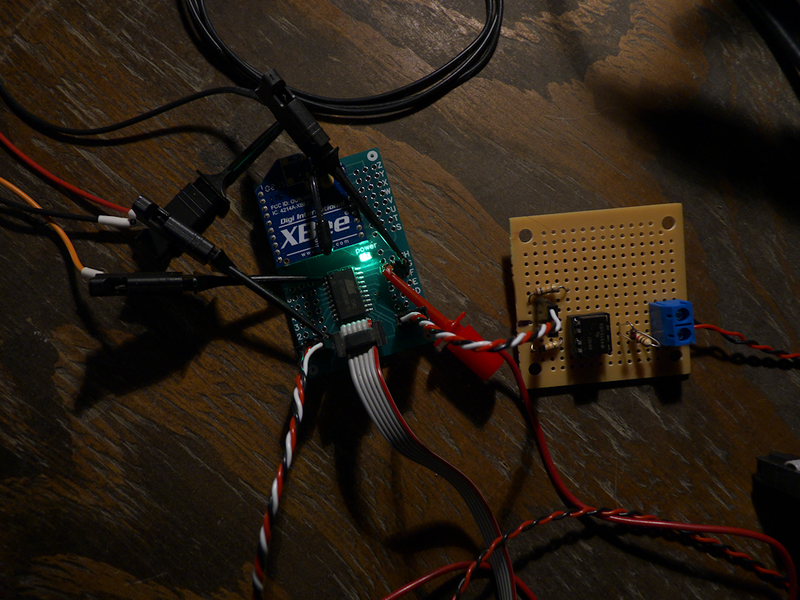 The input from the DCC system is run through an optoisolator to get the voltage down to logic levels. I then wrote an IRQ routine to decode and assemble the DCC packets. These get queued, error checked and then passed to the Xbee transmit routine. I pull the DCC destination address (either 1 or 2 bytes) out of the packet and use that as the Xbee destination address. In the Atmel Studio pic above, you can see the Xbee X-CTU utility displaying a stream of Xbee encoded DCC messages for address 8522. Anything addressed to 8522 flows out over the air and into this particular Xbee which will eventually be on the client controlwidget. 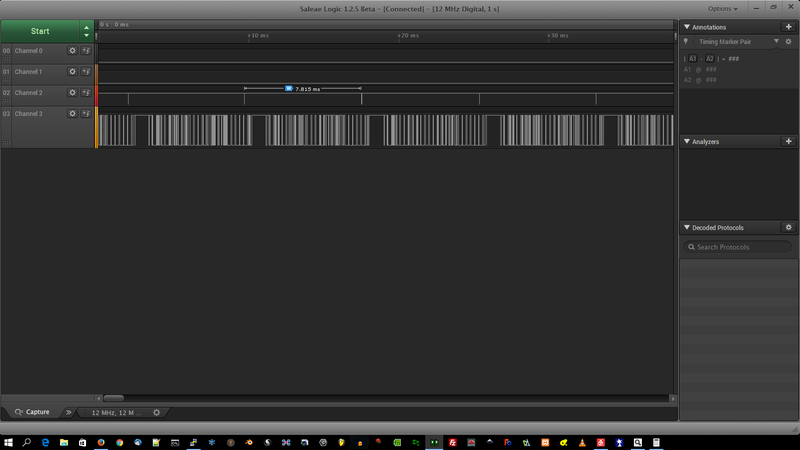 In the logic analyzer pic, you can see I’m blasting these out about every 7ms or so. Pretty fast! This is just for experimental purposes now, just to see how fast I can go over the air. This will eventually change so that the client is doing all the work maintaining the DCC output while the master only sends packets that have changed since the last scan. This will keep the network traffic down. 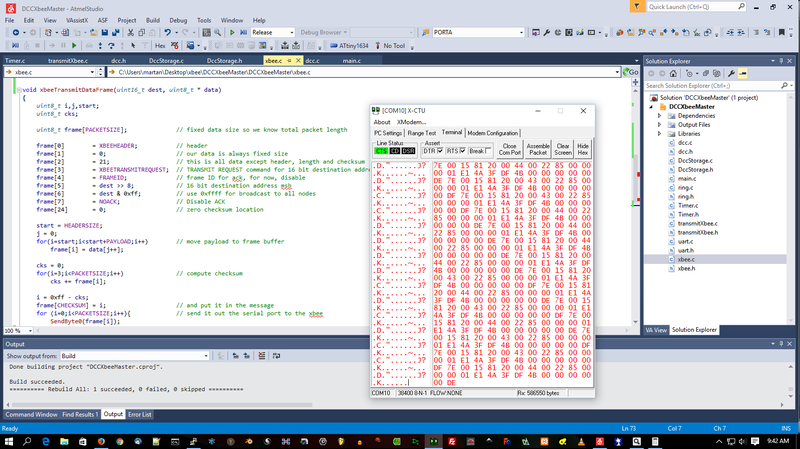 Next step is to get the client going, decode the packet and apply it to the various things. Servos, Motor Controllers, lights, etc. With a controlwidget as a ‘decoder’ there is not much off limits- drive servos for steam locomotives or large motor controllers for battery locomotives. Or, a little more esoteric, create a ‘router’ that divides the mobile and accessory traffic into different xbee streams? On different channels too. Hmm.